With a couple of new tricks up your sleeve, this could be your first winter on two wheels. 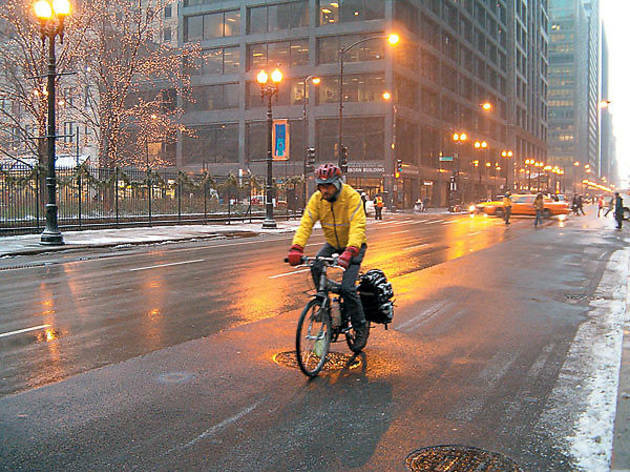 Four-season cycling is not just for bike messengers and the clinically insane: With these tips, even you—yes, you—can roll through whatever Mother Nature throws your way. The tough part is getting through fall. If you can make it through a soggy, unpredictable Chicago autumn, you’ve done most of the work already. Your hands, feet and face are your weak points. That’s where you lose most of your body heat. If you can keep them toasty and comfortable, everything else will take care of itself. Start with warm socks; Uncle Dan’s has SmartWool socks for $11–$21 (2440 N Lincoln Ave, 773-477-1918). Windproof mittens or gloves are also a necessity: REI’s Ridgecrest mitten ($50, 1466 N Halsted St, 312-951-6020) comes highly recommended, and don’t forget a balaclava (see below). Get a balaclava, stat. Nothing beats a wicking balaclava (a.k.a. ski mask), which fits smoothly under a helmet, protects your face and keeps the icy chill from finding its way down your collar. Try the ones sold at Boulevard Bikes ($18, 2535 N Kedzie Blvd, 773-235-9109). Cotton is the enemy. Unless you just moved here from Texas, you’re probably already a pro at layering. But don’t start with cotton. “It soaks up water and holds it against your skin,” warns Martin Hazard, who runs winter-biking seminars at Performance Bike (2720 N Halsted St, 773-248-0107; next workshop is Nov 16 at 6:30pm). Any “technical” fiber—wicking materials with names like Coolmax—keep you warm by moving sweat away from your body. Start underdressed. You’ll warm up as soon as you get moving. Your torso (but not your hands and feet) should feel a little underinsulated as you begin; you’ll be surprised how light a coat you need. Your jacket does need to be windproof, though. Bike Nashbar carries windproof, breathable jackets starting at $60; but you may already have an appropriate top layer in your closet. Yes, you can bike in the snow. If a plow’s given the street the once-over, it’s bikeable. Just don’t go speeding out of the gate as if the pavement were dry. “You do have to take things a little more slowly and ride a little more cautiously, especially when you’re cornering,” notes Lauren Sailor, cochair (with Hazard) of this year’s Chicago Bike Winter movement. After a big snow, riding in cars’ tire tracks is a good technique. But when metal grates on the downtown bridges freeze over, walk your bike on the sidewalk. Your current tires are fine. Thin tires cut through the snow; wider tires roll over it. Either way, you’re good to go. Make yourself seen. “In the wintertime, it gets dark much sooner, so visibility is really important,” says Joe Abbatacola, who runs winter-biking workshops at REI Lincoln Park. Dark days call for both a headlight (required by law) and a taillight. Even in daylight, cars aren’t expecting to see a bike on the road—so wear a reflective jacket or vest. Give your bike a little extra TLC. Removing snow and water from your bike after a ride will keep it rolling smoothly. “Bounce your bike up and down a couple times before you lock it up, to get any snow or slush out of the components,” advises Sailor. A quick towel-off at the end of a snowy ride is advisable, too, as is weekly chain lubing if you’re riding every day. There’s safety in numbers. There’s no reason to face the cold alone. 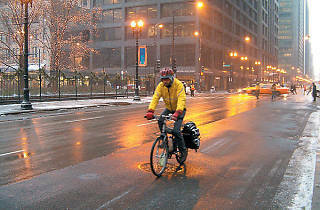 BikeWinter.org lists group rides and workshops plus winter-biking-related tips.